The Class of 2017 has already surpassed last year’s graduating class in their participation rate for the senior class gift, which contributes to financial aid for the Class of 2021. To date, 462 seniors have donated to the class gift, raising a total of $8,989.59. The participation rate so far is 43 percent, and the organizers aim to reach a participation rate of 50 percent by the end, according to managing director of Dartmouth College Fund individual and class giving Heidi Conner. In recent years, participation rates for donations have dropped. In 2010, all but one student in the graduating class donated, reaching a peak participation rate of 99.9 percent. The Class of 2016, by contrast, had a participation rate of 31.3 percent, the lowest since 2004. The drop in participation from the Class of 2015, which had a participation rate of 61 percent, to the Class of 2016 was the steepest drop in over a decade. The Class of 2016 raised $15,887, which was $4,256.30 less than the year prior. 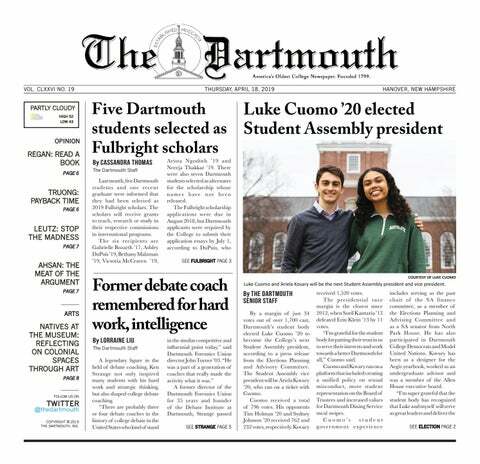 In the 2015 fiscal year, Dartmouth ranked fifth for senior class gift participation rates in the Ivy League, ranking below Princeton University, Yale University, Harvard University and the University of Pennsylvania. Princeton, which asks graduating classes for pledges rather than donations, boasts the highest senior participation rate in the Ivy League with a 91.3 percent pledge rate in 2016. The recommended donation amount is $20.17, but actual donations have ranged significantly above and below that number, senior class gift co-chair Mary Sieredzinski ’17 said. The average amount donated so far is $19.54, with the smallest donation being 17 cents and the largest donation being $201.70, Conner said. Throughout the month of April, the Class of 1967 matched every dollar that was donated by students. They also have promised to fully sponsor two additional members of the Class of 2021 if the fund’s participation rate reaches 50 percent. Those involved with the fundraising efforts include four chairs and approximately 40 volunteers, Sieredzinski said. The volunteers are educated on how the senior class gift fits into the larger Dartmouth College Fund, which finances all financial aid, and their job is to help spread the word and encourage students to donate. The chairs themselves focus more specifically on concrete fundraising work. Maria Jarostchuk ’17 said that the student-organized nature of the campaign encouraged her and many of her classmates to donate. Sieredzinski said that fundraising efforts include creative challenges throughout the campaign to encourage people to donate. For example, the “Greek challenge” awarded gift cards to the Greek house with the highest percentage of donating members, and over Winter Carnival, fundraising efforts included a raffle for original Winter Carnival posters. The organizers attempted to increase participation rates this year by starting the campaign earlier and focusing on keeping the senior class well-informed on what exactly the money would be used for and why it was important, Sieredzinski said. According to the senior class gift website, 100 percent of all donations to the fund will go toward financial aid. The senior class gift has been fully dedicated to financial aid for the past several years, Sieredzinski said. Jarostchuk cited this as her primary motivation for choosing to donate. “I’ve been on financial aid all four years here, and I think it’s really important … no one should be denied the opportunity to go to school here just because of finance,” she said. Sierdzinski noted that Dartmouth is ranked as one of the top schools when it comes to financial aid, and the school is also among only a few universities that adjust the aid that is given according to changing financial circumstances throughout a student’s time here. She said educating students on these details has been a main focus for those involved in the campaign. She noted that some students make the choice not to donate because they consider the choice to indiciate implicit approval of the administration. “They are allowed to interpret that whichever way they want, but that’s not a fact,” she said. Though Sierdzinski acknowledged that she worked with the administration, she said administrators do not use participation rates to gauge the level of approval held by the student body. “I think the ’16s stigmatized it that way … and we’ve been trying to combat that stigma,” she said. A member of the Class of 2017 who wished to remain anonymous due to the sensitivity of the topic noted in an email statement that publicity released by the school did suggest that high participation rates for the senior class gift were often interpreted as a sign of student support for administrative decisions. The student said that, because the majority of student donations are such minimal amounts, the senior class gift cannot be more than “a drop in the bucket” for financial aid. Instead, the school seems to care only about the participation rate as a sign of enthusiasm for the school, they wrote. Sierdzinski said that frustration or disapproval of decisions made by the College should not be a reason to abstain from the fund. “It’s on us to ensure that future students from all backgrounds can come here and they’re going to be the ones to combat these problems on campus … empowering students and giving them the opportunity that you were given, at least so they can see things on their own, is what’s really important,” she said.